How To Get Away With Murder pedals some far-flung ideas—namely, the idea that anyone is capable of murder. But something much easier to get behind is the recurring sentiment on the show that the legal process is inextricable from human emotion. How To Get Away With Murder persistently challenges the idea that laws and courts are black-and-white systems guided by pure fact and precedent. Courts are filled with humans, and humans bring along baggage, prejudices, and emotions. 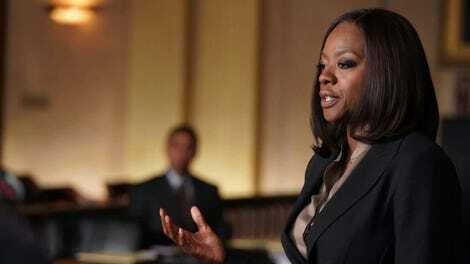 In “It’s For The Greater Good,” Annalise accuses Bonnie of being unable to separate her emotions from the case, and Bonnie throws that right back in Annalise’s face. In truth, none of them can separate their emotions from their legal work. But “It’s For The Greater Good” winds up being an emotionally distant episode—all plot and not enough humanity to really give it palpable stakes. Michaela’s naturally thrown by Laurel’s information about her father’s involvement in Wes’ death, hesitant to help Laurel out because, you know, it could get them both murdered. Her new internship at Caplan & Gold takes a reality competition show turn when the interns are pit against each other in a multi-round trivia competition about the firm. It’s meant to seem high-stakes, but it isn’t all that exciting. Amirah Vann, at least, is alluring and imposing as one of Michaela’s new bosses, Tegan. Hopefully, Michaela and Laurel’s collaboration in the takedown of Laurel’s father gathers momentum, because after the intense moment of Laurel telling her last episode, the storyline just remains stagnant here. Speaking of stagnant, Connor leans into his existential crisis by quitting law school, which gets him a huge refund check that he’s free to spend on drinks and go-go dancers. The rest of the Keating Four, plus Frank, stage an intervention to tell him he’s being dumb. Then his dads show up at the end to lecture him? 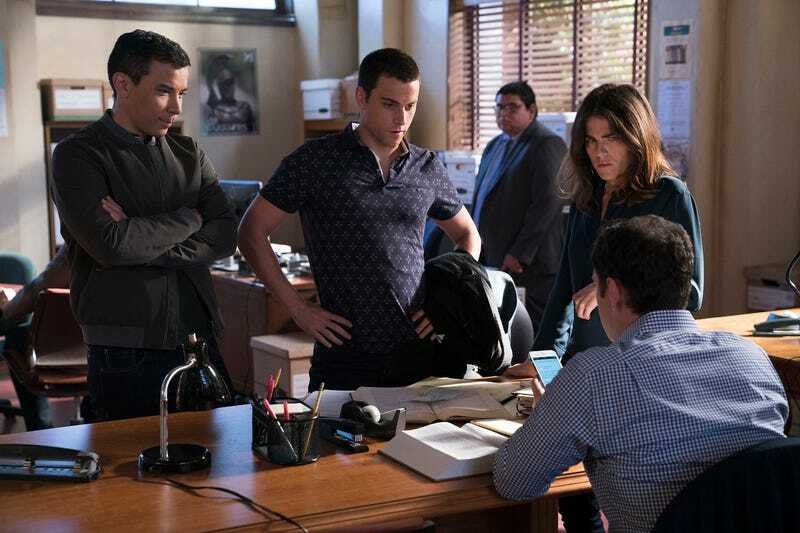 Connor’s lack of interest in law school isn’t exactly coming out of nowhere, but like too many other storylines this season, it just doesn’t have any teeth to it. How To Get Away With Murder often slips into plot-spinning mode, becoming far too mechanic. That’s exactly what “It’s For The Greater Good” feels like: tedious table-setting with a few strong scenes and thematic tie-ins but not enough emotional coherency to really bring it all together. Annalise, at least, continues her case against the entire justice system, zeroing in on the obstacles stacked against public defenders to properly do their jobs. The episodic case hinges on a careless error made by a public defender due to a lack of time and resources. As unrealistic as How To Get Away With Murder is in its portrayal of courtroom proceedings and the actual mechanics of the legal system, it’s sharp and poignant in its big-picture critiques of the criminal justice system, which so often works against poor people and people of color instead of for them. How To Get Away With Murder shines in these moments that scrutinize power, systemic inequality, and (in)justice. How To Get Away With Murder is no stranger to messed-up relationship dynamics, but I just can’t place a finger on exactly what Annalise’s relationship with her therapist is supposed to be. To reiterate a point from last week, he’s a very bad therapist! Here, he suggests that her determination to bring a class action suit against the state is an obsession on par with her addiction, and that just...doesn’t really track. She accuses him of trying to reinforce his power over her as a response to what she told him about Sam, and that certainly seems to be the case. But it’s still difficult to parse out exactly what we’re supposed to glean from the therapy scenes. They embody the same strangeness as past Annalise/Wes and Annalise/Sam scenes did. In both of those cases, the character development was so all over the place that the relationships were, rather than complex, inconsistent and confusing. “It’s For The Greater Good” doubles down on some of the least interesting storylines of the season, like Oliver’s new IT company, Connor’s disillusioned view of law school, and Michaela’s cut-throat internship, while the storylines with the most potential for thrills, like Laurel’s quest for revenge and Annalise’s path toward redemption don’t get enough time in the spotlight. And the midseason mystery teased each week in the final flash-forwards lack momentum, particularly because they hinge on a huge Laurel moment while Laurel in the present has been pretty one-note and, frankly, boring. “It’s For The Greater Good” is dense with plot, and yet nothing really happens. How To Get Away With Murder too often gets stuck in its own web. Are they still trying to make Nate/Bonnie a thing? For a moment, I thought Bonnie slipped Annalise the DVD. Like Nate, I just have a feeling that Bonnie is going to come back to Annalise at some point. The death of Annalise’s client from last week seems a bit unnecessary as of now. As frustrating as the therapy scenes are, Annalise’s recovery has been one of the most honest parts of the season, particularly because of how messy it has been. She hasn’t slipped, but it’s still very clearly a struggle for her to stay sober. Frank is, increasingly, a pointless character. Annailse’s therapist mistakes Michaela for Annalise in the flash-forward, which is indicative of how poor his powers of observation are. Okay, so speaking of that flash-forward, my theory is that the “he” Michaela refers to is Asher and not the baby.